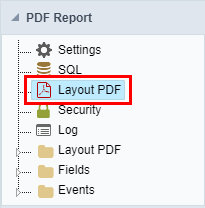 The PDF Report application has a way of positioning the report fields in a simple and dynamic way, using the drag and drop functionality. In the PDF Layout, at the main screen, you can change some application settings. These settings are also present in PDF Report > Settings. 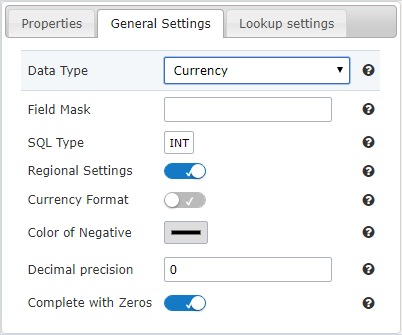 Using Drag and Drop functionality, you can configure the placement of fields in this interface. To change them you need to click on the field you prefer to change the position and drag to their new position. 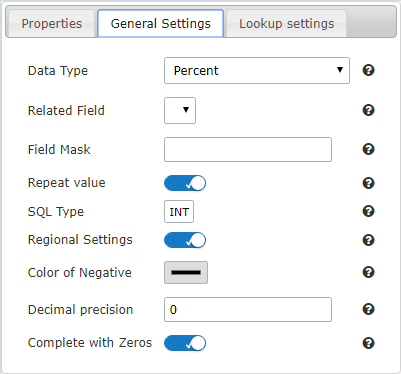 Clicking on a specific field opens a field configuration screen. Name: On this field, it is necessary to inform a name to identify the field. System Date: The current date of the system on which the application runs. Current Page: Number of the current page that the cell is located. Total Page: Total number of application pages. 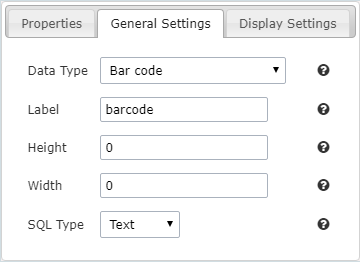 Label: Selecting this option will open an input so you can inform the text that will be displayed. Pos X: Positioning the X axis. Up and down. Pos Y: Positioning the Y axis. Left and Right. Width: Enter the width of the cell. The unit of value is pixel. Alignment: In this field, you will select the alignment of the cell text: Left, Right or Center. Font: In this field, you will select a source according to the list. Font Size: Here you inform the font size of the text that will be displayed. Show: In this field, you enable or disable the field display. Data Type : Define the type of field for the application. Capitalize first word : Capitalizes the first letter of the first word. Capitalize all words : Capitalizes the first letter of all the the words. 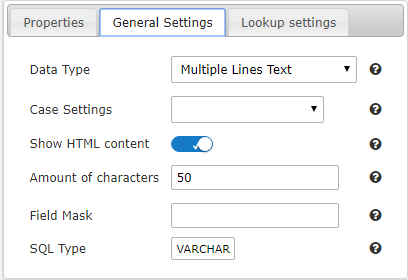 Show HTML content : Determines if the html contained in the field will be displayed or not. If enabled, the html will be displayed, otherwise the html will be interpreted by the browser. Amount of characters: Defines the field width. 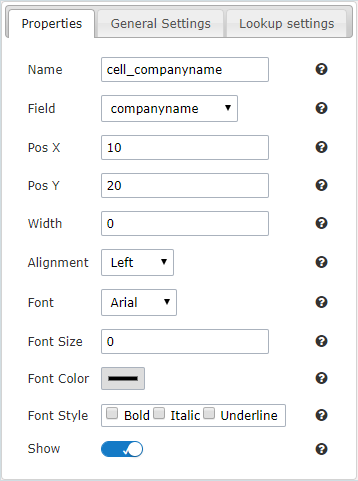 This option is available only for the field type Multiple lines text. 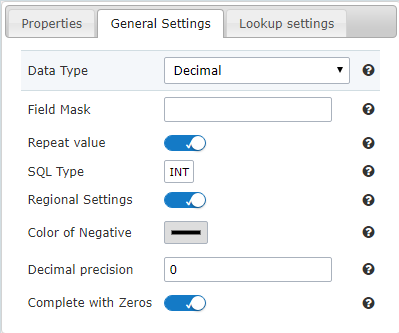 Field Mask: In this field, you can configure a display mask according to the table given in Applications> Grid > Fields> Text. 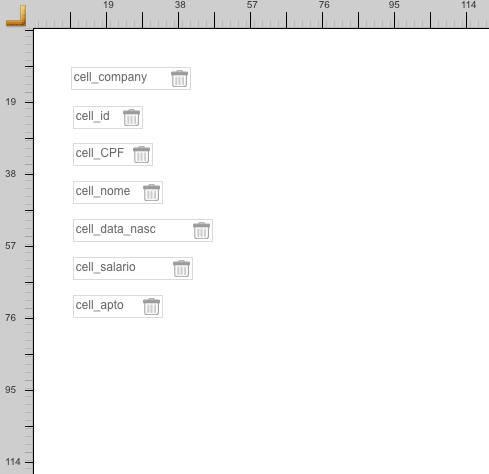 SQL Type : Informs the data type of field in the database. 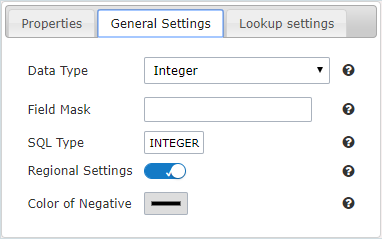 Regional Settings : Allows to apply the Regional Settings to format of the fields. When not enabled, you will view attributes for set yourself. You can change of the Regional Settings in Locales >Regional settings. For more information click here. Currency Format : Defines the content of the field that if it will be presented with the currency format. Decimal Precision : Number of decimal places. This value is part of the field size. Complete with Zeros : Defines the decimal places that will or not be completed zeros to the right. Example: The value is 125,50, but the decimal precision is 3. If the option is enabled, then the value will 125,500. Related Field: Field that contains the values for the calculation of the percentage. Display: Offers a series of formats predefined for displaying dates. 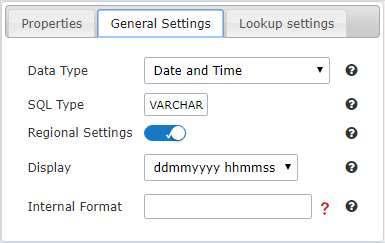 Internal Format: Defines the internal format of the fields (for database storage) date, time, and datetime if the field type in SQL is varchar type. Height: Sets the height in pixel of the image display. Must contain only numbers. Width: Sets the width in pixel of the image display. Must contain only numbers. Level of error correction: Codewords are 8 bits long and use the Reed–Solomon error correction algorithm with four error correction levels. The higher the error correction level, the less storage capacity. 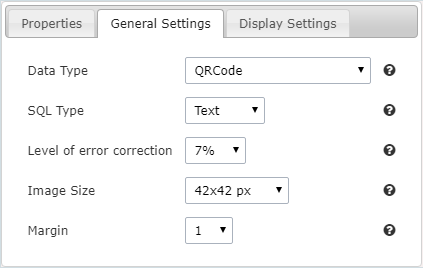 Image Size: Lets you set the display size of the QR Code by selecting one of the available sizes. Margin: Lets you set the margin width around the QR Code by selecting one of the available sizes.